The history of Kraftwerk begins in 1970 when Florian Schneider-Esleben and Ralf Hütter, the founding members of the band, formed a group called Organisation. The Oranisation’s only album, Tone Float, was a mixture of tape loops, electronic feedback, and clanking rhythms. It was decidedly experimental compared to what the rest of the musical world was doing, and while a German record contract was landed, the LP did very little in the way of sales. By the end of that same year, however, the group had morphed into Kraftwerk. 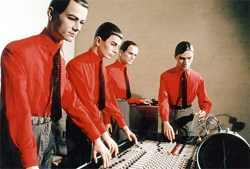 Since then, Kraftwerk has become an icon in our culture representing the extreme in robotic pop music. It started with their 1978 album, The Man Machine (Die Mensch Maschine in German), a completely synthetic group of songs that featured homemade drum machines (existing machines, the German band felt, were not good enough) and consciously tried to be as non-human as possible. Kraftwerk began to publicly portray themselves as automatons with plastic hair and matching, generic tech-engineer clothing. This look, augmented by catchy synch songs like “We Are the Robots,” established this iconic status. These moves were way ahead of their time, predating and influencing groups like DEVO, Gary Numan, and just about every electronic artist to date. That pivotal album can arguably be seen as the beginning of both techno and hip hop. In 1981, the group release Computer World, which was more of the same, but referenced the coming personal computer revolution with the single, “Computer Love.” In 1986, Electric Café came out, though it was a victim of the group’s own influence; pop music was by that time immersed in synthesizers and drum machines, and despite Kraftwerk having been the forefathers of that sound, their contribution was largely ignored. Time has a way of spinning things in our culture, however, and 20-some years down the road, Kraftwerk is largely recognized for their contributions to modern music, much of that acknowledgment having come from modern artists crediting their influence to the group. The band is releasing new material, and while it doesn’t offer the simplicity or kitsch of The Man Machine (or even the album Autobahn before it, which had a more esoteric and less poppy feel), it does allow the group to tour and play their older material. What’s interesting is the fact that the material from late 70’s and early 80’s is still completely relevant both in conceptual focus and style. Drum machines have never gone away, and some of the most sought after sounds are those of the machines that Kraftwerk themselves constructed. Synthesizer pop is as popular as ever, and we still have a love/hate relationship (or is it worship/fear?) with computers and all technology. As Kraftwerk’s 1978 “We Are the Robots” song points out, “…we are programmed just to do anything you want us to… we’re functioning automa-tic and we are dancing mechan-ic.” But are “we” the robots or the humans?